A toy is an item that can be used to play with and be used as the main actor in toy photography. Toys are generally used by children, pets and toy photographers alike. Playing with toys help kids form a different perspective about life and the society they live in and opens up a magic world for toy photographers to explore while pets take resilience to a complete new level when it comes to toys. The origin of toys is prehistoric; dolls representing infants, animals, and soldiers alike (did anyone say stormtrooper ?) are readily found at archaeological sites. Given that the origin of the word “toy” is unknown and photography dates back to the first experiments of Aristotle, Moo De and Euclide long before we run in the first daguerreotype, now seems to be a good time to explore not just the question of why we shoot toys, but also what was our first memory of shooting plastic. Mike set the scene with his post earlier this week and I know Vesa is eagerly looking forward to beat Mike to it (talk about toy photographers testosterone in wanting to be the first) while I only saw the light in early 2011 on IG (yeez, I am a youngster amongst dinos here). So, the new series here on Stuck In Plastic is all about that magical first photo that puts you straight on the world map of toy photographers dinosaurs and rising starlets alike and what it means for you. 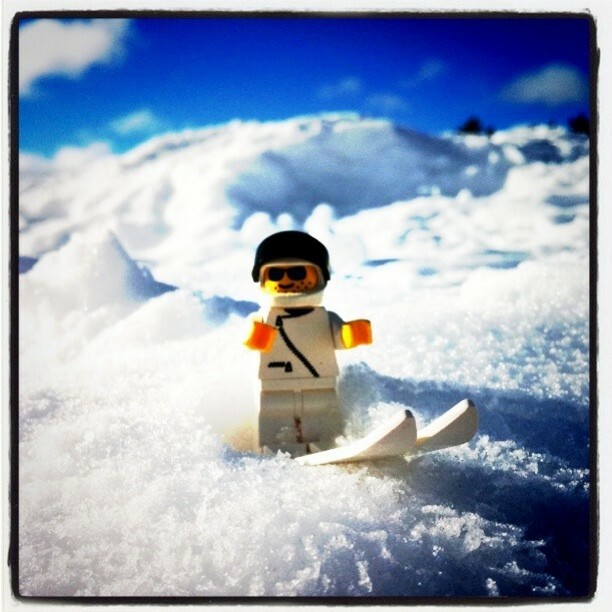 My very first IG picture was in the ice cold snow of Sweden and so far it is the oldest in the IG history (only 3 pictures tagged), but I am sure some of you will beat me to it, by tagging theirs to the #myfirsttoyphoto tag (IG new sorting order puts them in the correct order, so that is great). I still remember this selfie as it was yesterday. Icecold, sunny, early in the morning and no Starbucks around. My skiing outfit was maybe not the best, and one could argue that the burned edges have always been dated and some may say that baking powder beats real snow every single day, yet this was my very first picture on the slopes early 2011. Camera of choice was an iPhone as the whole “thing” was to prove that “photography” did work with an iPhone and you did not needed a (D)SLR to take good pictures … (I had one in my backpack which I did not use at that time). Until today this picture has a very special meaning for me. There are older (much older) toy photography images in our family lineage, but the selfie on slopes taken with an iphone with frozen fingers and a big smile on my face, started the whole social engagement for me on IG (it took me years to understand what the word “flickr” through images meant, (obviously something completely different as LGBT), and so IG was my outing and platform of choice but that is yet another topic). Hmm. I must say I love your argumentation here. Curious what Vesa has to add to this. Naked woman under water versus snowflakes. A difficult artistic decision. My first photo was of a Triceratops I had purchased as a guide for a comic book project at the time. I placed it in my backyard, grabbed my phone and snapped a shot… Who knew. Oh man, all I said was that I liked Mike’s post and that it would make a nice series and that my first Lego photo predates the one in his post by about 25 years. Now I am the guy who preferred toys to naked women? Well, you know, at the age of thirteen toys were more accessible. As I’m not going to beat Vesa if he finds his first photo (I didn’t even have a camera until 2001! ), I’ll just leave you with the earliest toy photograph I could find, from 1888.